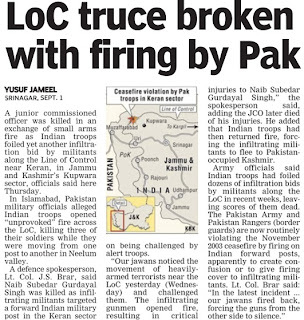 Ehsan Fazili Tribune News Service Srinagar, September 1 An Indian soldier was killed and another hurt while thwarting an infiltration bid and two ceasefire violations by Pakistani troops in the strategic Keran sector in north Kashmir. Three Pakistan soldiers were also reportedly killed in the retaliatory fire by the Army. The exchange of fire was going on till the last reports came in. “Pakistani troops twice violated the ceasefire by shelling forward posts in the last 24 hours,” defence spokesman Lt Col J S Brar said, adding that heavy mortars and machine guns were used. “They first opened fire at around 8 pm last evening. The Indian troops retaliated and in the subsequent exchange of fire that continued for around 50 minutes, a jawan was injured. His condition is stated to be safe,” Brar said. “At 11 am on Thursday, the Pakistani side resorted to heavy firing again. The exchange of fire was continuing till last reports came in,” the spokesman added. According to reports, at least three Pakistan Army personnel have been killed in the retaliatory fire. “On Tuesday evening, an infiltration bid from across the border was also made. 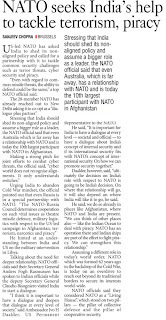 It was effectively foiled by our alert jawans,” Brar said. One JCO, Naib Subedar Gurdayal Singh, a resident of Ropar in Punjab, was killed in the operation. The ceasefire violations in north Kashmir sectors are believed to provide a cover to armed infiltrators. The Keran sector in the Kupwara district is a major ingress route of the militants from across the border and the fresh ceasefire violations come close on the heels of a major infiltration bid reported from the adjacent Gurez sector on August 20. At least 13 infiltrators were killed in that encounter. 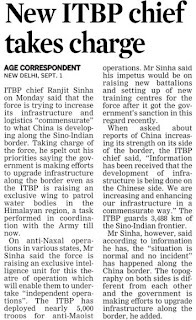 Infiltration attempts are mainly made during the summer months after snow on high mountains along the LoC starts melting. Tribune News Service New Delhi, September 1 India and China have separately denied reports in a UK newspaper which hinted that the navies of the two neighbours had a tiff off the coast of Vietnam in July in the South China Sea. The Indian External Affairs Ministry and the Ministry of Defence in separate denials have made it clear that there was no confrontation. The Chinese foreign office was quoted in media as having said that “we have no information about the incident”. An official spokesperson said Indian Naval warship INS Airavat paid a friendly visit to Vietnam between July 19 and 28. 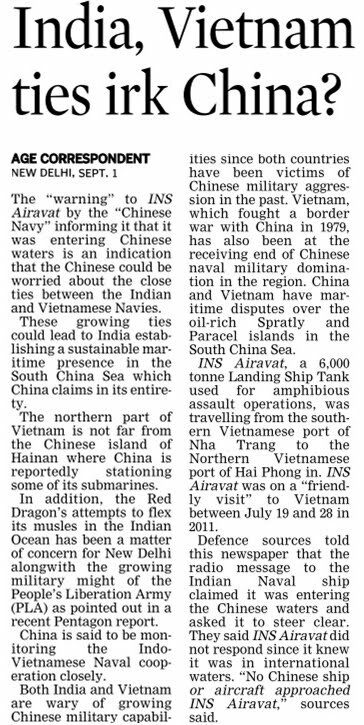 On July 22, INS Airavat sailed from the Vietnamese port of Nha Trang towards Hai Phong, where it was to make a port call. At 45 nautical miles from the Vietnamese coast in the South China Sea, it was contacted on open radio channel by a caller identifying himself as the “Chinese Navy” and stating that “you are entering Chinese waters”. No ship or aircraft was visible from the INS Airavat, which proceeded on her onward journey as scheduled, the spokesperson said. 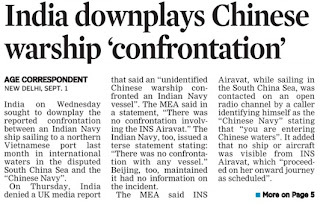 “There was no confrontation involving the INS Airavat,” the spokesperson said, adding that “India supports freedom of navigation in international waters, including in the South China Sea, and the right of passage in accordance with international law”. 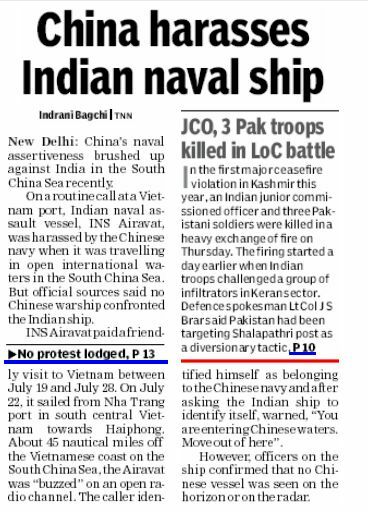 Sources here explained that warships do not interact with each other on the high seas unless the nations are friendly, hence there was no question of the Indian warship responding to any call by any warship on the high seas. 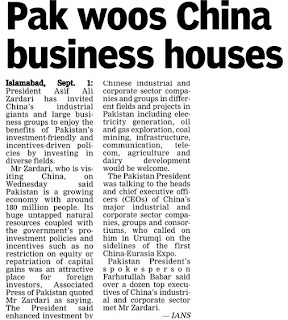 And there is no question of one ship stopping the other as being quoted in the UK newspaper. 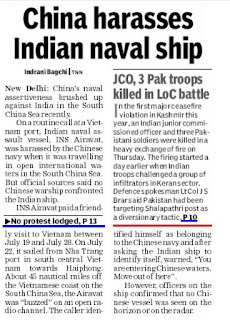 Also, being in international waters, India was not duty bound to inform China about its warship being in Vietnam. The INS Airavat is a 5,600 tonne amphibious warship -- having the capacity to land troops and vehicles close to a coast without having to berth at a conventional harbour jetty. It was commissioned in 2009. China in July last year claimed “indisputable sovereignty” over the South China Sea. 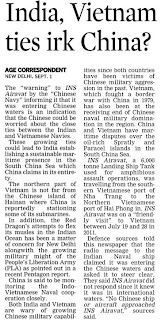 Vietnam, Malaysia and the Philippines have been irked by Chinese claims that extended hundred of miles beyond the internationally accepted maritime boundaries. A fresh attempt is being made to build consensus within the Government to amend the controversial Armed Forces Special (Powers) Act, Home Minister P Chidambaram [ Images ] indicated on Thursday. 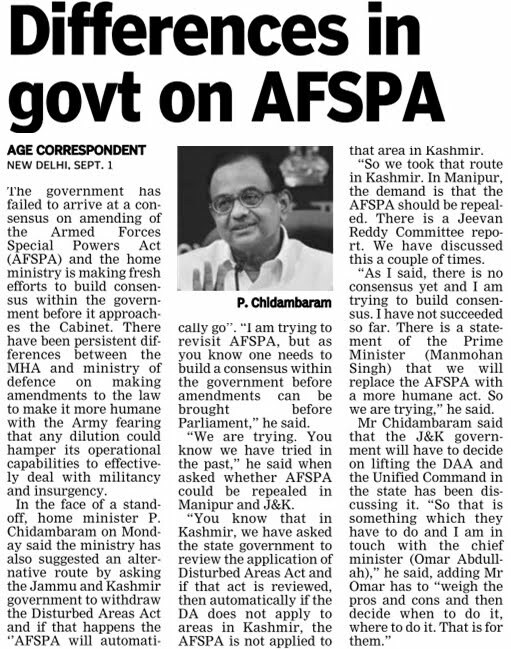 "I am trying to revisit AFSPA but as you know one needs to build a consensus within the government before amendments can be brought before Parliament," Chidambaram said while replying to questions after presenting the monthly report for his Ministry. "We are trying. You know we have tried in the past," he said during the press interaction on being asked whether AFSPA could be repealed in Manipur and Jammu and Kashmir [ Images ]. 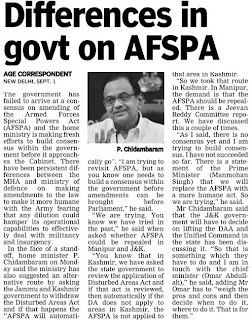 He said in J&K there was a consensus within the Central Government that if the state withdraws the Disturbed Areas Act, AFSPA will automatically go. "You know that in Kashmir, we have asked the state government to review the application of Disturbed Areas Act and if that act is reviewed, then automatically if the DA does not apply to areas in Kashmir, the AFSPA is not applied to that area in Kashmir. "So we took that route in Kashmir. In Manipur, the demand is that AFSPA should be repealed. There is a Jeevan Reddy committee report. We have discussed this a couple of times," he said. "As I said, there is no consensus yet and I am trying to build consensus..I have not succeeded so far. There is a statement of the Prime Minister (Manmohan Singh [ Images ]) that we will replace the AFSPA with a more humane act. So we are trying," he said. The army has conveyed its apprehensions to the Defence Ministry that replacement of AFSPA or any dilution could hamper its operational capabilities to effectively deal with militancy and insurgency. "On the first route (in JK) there is a consensus at the Centre. Now at the operational level, the JK govt would have to, in the Unified Command, agree to review the application of Disturbed Areas Act," he said. 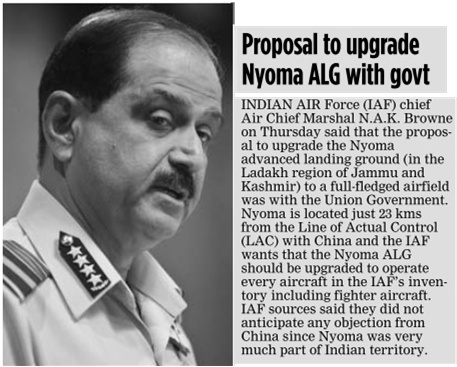 "If they are able to lift the DAA from, say five places, then AFSPA would not apply to those five places. So that is something which they have to do and I am in touch with the Chief Minister (Omar Abdullah [ Images ])," Chidambaram said, adding Omar has to "weigh the pros and cons and then decide when to do it, where to do it. That is for them." Omar's government in the state has already constituted a Committee earlier this year to review the DAA. The Committee comprises Director General of Police, Home Secretary and Corps Commander of 15 Corps (for Kashmir) and Corps Commander of 16-Corps (for Jammu). The Committee has met twice so far and is expected to meet again next month. The AFSPA gives the Army the powers to detain and, if the situation warrants, eliminate suspected terrorists when they are fighting insurgents without the fear of prosecution. The Act is only in force in some areas in Kashmir and insurgency-affected states in the north east. The Second Administrative Reforms Committee had suggested to the government replacing of the Act with an amended law which gives the Centre the right to deploy the Army or para-military forces in situations involving national security. The Pakistan army violated the ceasefire agreement of 2003 and opened fire in Keran sector of Kupwara district in the early hours of Wednesday. The intermittent firing continued on Wednesday evening and on Thursday too, beginning around 8 am and carrying on till late evening, injuring a jawan. 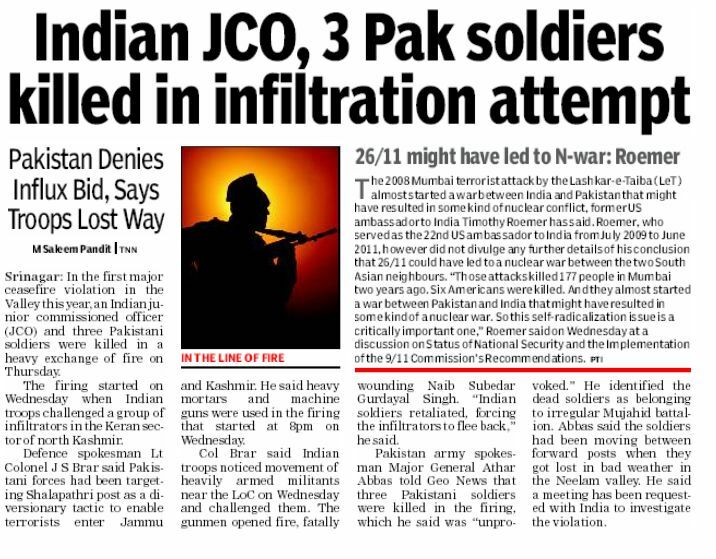 In the retaliatory firing from the Indian side, three Pakistani soldiers died. Reports from Pakistan quoting military spokesman Major-General Athar Abbas said: "Our soldiers were moving from one post to another when they came under fire. Three soldiers were killed." A defence spokesperson said the army was forced to retaliate after it came under heavy fire from the Pakistan army, which was a violation of ceasefire agreement signed by the two countries in 2003. "The Pakistan forces fired from Saheli post along the Line of Control (LoC) last night, which continued for about an hour," defence spokesperson of northern command Lt Col JS Brar told HT. In the early hours of Wednesday, an infiltration attempt was made in the area and a Naib Subedar died while foiling it. At the same time, the army came under heavy fire from across the LoC. "The Pakistan army was providing covering fire to the infiltrators," said an army officer on condition of anonymity. There has been a rise in infiltration attempts lately, especially in the Kupwara sector. On July 30, three army personnel died in Furqiangali during an encounter with heavily armed infiltrators. 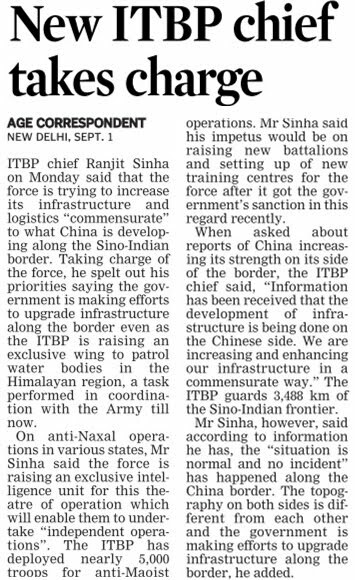 In August, four infiltration attempts were foiled and five terrorists died in counter-insurgency operation. New policy likely to dilute offset requirements, bowing to sustained lobbying from foreign vendors. 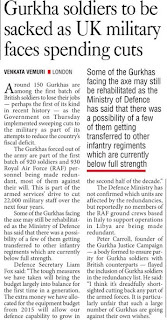 The Ministry of Defence (MoD) is finalising a revised defence offset policy. Business Standard has learnt the new policy would dilute offset requirements substantially, bowing to sustained lobbying from foreign arms vendors and making it easier for them to discharge their offset requirements. Indian industry has protested that this would defeat the aim of offsets, which was to promote indigenisation. A Ficci delegation from Indian defence companies, invited to the MoD on July 23 to discuss offsets told Defence Minister A K Antony that the growing number of loopholes would make defence offsets a bigger scam than the 2G-spectrum scandal. A shaken Antony assured delegation members their concerns would be heeded. The new policy is going ahead, nonetheless. 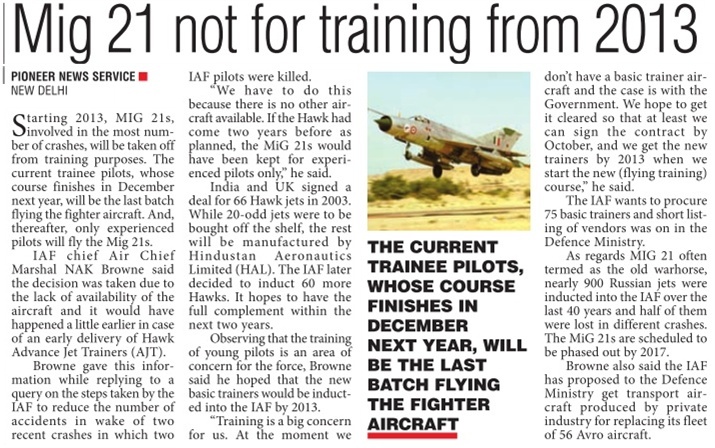 MoD sources involved in the drafting reveal the policy revisions would allow transfer of technology (ToT) to be counted as an offset. Also on the anvil are “multipliers”, which would give vendors extra offset credits in fields where foreign assistance is badly needed. For example, if the Defence Research and Development Organisation (DRDO) urgently requires metallurgical technology for building jet engine combustion chambers, the MoD could place a multiplier of, say, five on that technology. The new policy would give the vendor offset credits worth five times the cost of the technology that it transfers. So far, the MoD has shied away from including ToT in the list of permissible offsets. 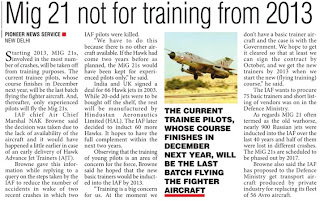 The previous secretary for defence production, R K Singh (now the home secretary) admitted to this newspaper last year that it was extremely difficult to accurately value technology. The new policy could also extend offsets to fields barely linked with defence, such as “project management”, a catch-all phrase that would allow vendors to claim offsets for routine business expenses like travel, accommodation, and the holding of meetings and conferences. “Offsets provide an opportunity to build a strong Indian defence industry. But if the offsets are liberalised to the level where vendors no longer need to provide benefits to the Indian defence industry, we will have lost a huge opportunity,” says Puneet Kaura, executive director, Samtel Display Systems. Offsets were introduced with the Defence Procurement Procedure of 2005 (DPP-2005). It initially required vendors who executed defence contracts worth Rs 300 crore or more to source from India defence products worth 30 per cent of the total contract value. 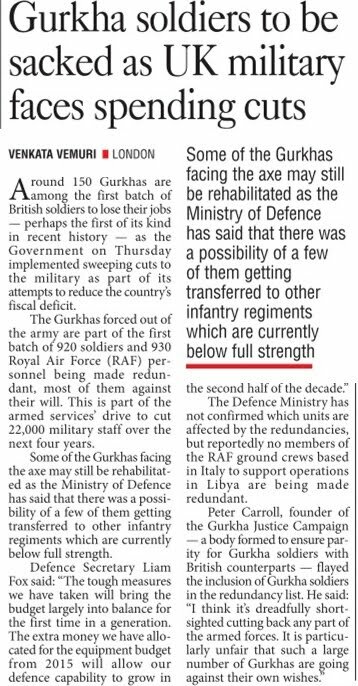 Alternatively, offsets could also be discharged through investment into defence JVs set up in India; or through investment into Indian R&D organisations. Over time — through DPP-2006; DPP-2008; DPP-2009; and DPP-2011 — the offset policy has become progressively less demanding of foreign vendors, first incorporating offset banking and then (in DPP-2011) permitting vendors to discharge offsets in civil aerospace, training and internal security. The offset policy initially followed the Kelkar Committee recommendations, which endorsed only “direct offsets”, i.e. connected directly with defence products. DPP-2011, however, opened the doors to “indirect offsets”. Now, the latest policy is set to widen that opening. 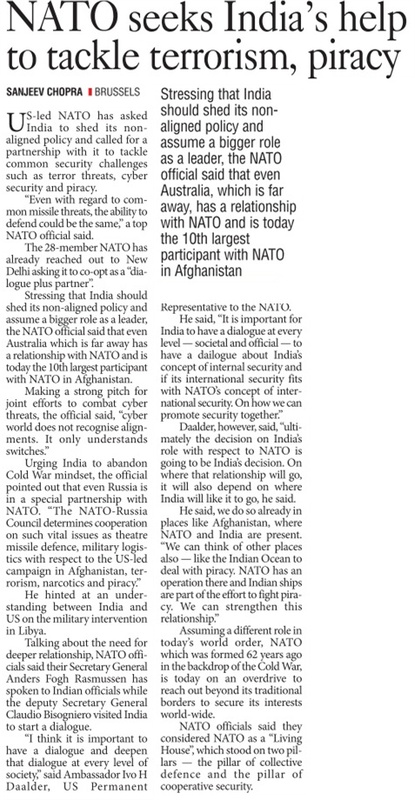 Business Standard has learnt that there is a vertical split within the MoD on whether offsets should be diluted. The Acquisition Wing, which procures defence equipment for the military and is responsible for expending the capital budget in full, views offsets as an inconvenient procedural hurdle that must be crossed before finalising a procurement contract. But the department of defence production (DDP), responsible for boosting India’s defence industry, regards offsets as a useful tool that can provide a growth impetus to industry. “Unfortunately, the Acquisition Wing currently examines the offset proposals from foreign vendors. If the DDP was given the resources and the staff to do this job, the interests of Indian industry would be far better preserved,” says an MoD official, who wishes to remain anonymous. Industry sources say after the Ficci delegation alerted Antony to the potential for scandal in offsets, the new defence secretary, Shashi Kant Sharma, who earlier headed the Acquisition Wing, has been inviting industry representatives to South Block to canvass their views. The MoD has not responded to a request for comments on this issue.